How about listening to the whole interior of your car replaying the music from your iPhone? No speakers! Sounds unreal, right? Yep, and it’s happening now. 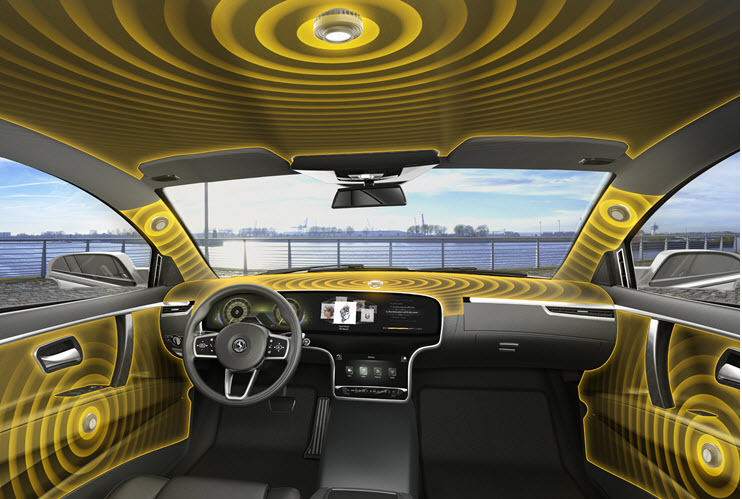 Automotive supplier, Continental, has designed a speaker-less audio system for cars, which uses existing surfaces to produce in-car audio. The system relies on a series of ‘actuators’ which ‘excite’ various surfaces in the car – like the A-pillars; the roof covering; the seat-backs and door panels. Just like regular speakers, the ‘actuators’ help move the panels, which create the sound. From a designers’ point of view this allows greater freedom in interior design, because they don’t have to allow for the fitting of speakers. From an audio designers’ viewpoint, they can address the various ‘sound nodes’ inside the car – which are areas which may ‘deaden’ or ‘enliven’ the sound, depending on either their absorption or reflective quality. The original demonstration, conducted for FORBES magazine, convinced the feature writer that the new system has great possibilities. The FORBES writer noted that the stereo separation was excellent, but the bass was a bit muddy and indistinct. It’s early days, and once Continental releases its specs, expect rapid progress – which will definitely not please speaker manufacturers.